Here begins the Crazy Eddie story. My name is Sam E. Antar. I started working at Crazy Eddie as a stock boy in 1971 and was eventually promoted to its Chief Financial Officer or CFO. I was ousted from the company in a hostile takeover in 1987. Eddie Antar is my cousin; Eddie’s father, also named Sam, is my uncle, my father’s brother. The original predecessor company to Crazy Eddie was ERS Electronics, which was founded by Eddie Antar, Sam M. Antar (Eddie’s father), and Ronnie Gindi (a first cousin) in 1969. Eddie, Ronnie, and Sam M. owned equal 1/3 shares of ERS Electronics. The original store was located at 1117 Kings Highway in Brooklyn, New York. The company operated under the name of Sights and Sounds. When Crazy Eddie was opening up for business during the early 1970s, consumer electronics retailers were subject to “fair trade” laws. These laws allowed manufacturers to require retailers to sell merchandise at the same price to avoid price competition for their products. These laws were having a negative effect on smaller retailers, such as Crazy Eddie. The larger chain store retailers, which had large advertising budgets, were forcing many smaller independent “mom and pop” retailers out of business. While smaller retailers had lower overheads, they were unable to compete with the larger stores by lowering prices because fair trade forced all retailers to sell merchandise at the same price. Therefore, the smaller retailers could not use their cost efficiencies to pass along better values to consumers and thereby compete against the chain stores. Around 1970-1971, Sights and Sounds, like many other small retailers, was struggling to stay in business. In 1971, Eddie Antar purchased Ronnie Gindi’s share of ERS electronics for $25,000 in cash. Eddie Antar now owned 2/3 of Sights and Sounds and his father Sam M. Antar owned 1/3 of Sights and Sounds. To survive in business, Eddie Antar resorted to circumventing fair trade by discounting merchandise to customers. The manufacturers retaliated against Eddie by refusing to sell Sights and Sounds any products. Eddie Antar was forced to buy excess merchandise from other retailers and access grey markets (overseas) to purchase merchandise. Around 1972, manufacturers were no longer able to require retailers to sell merchandise at the same price, and fair trade was outlawed. Eddie Antar became the hero to the New York metropolitan area consumer due to playing a role in abolishing fair trade. Many consumers considered Eddie Antar as a “retailing revolutionary” and they rewarded him handsomely as he opened up more stores. Crazy Eddie’s business volume expanded rapidly. In 1973, Eddie started one of the largest advertising blitzes ever seen in the tri-state area and studies showed that Crazy Eddie had better name recognition than Coca Cola among New York area consumers. Eddie Antar was a charismatic leader who inspired intense loyalty from his family and employees. It was us against them – “Them” being customers, the government, insurance companies, auditors, and everyone else who did not serve the company’s interests. There was a culture at Crazy Eddie that said nothing should go to the government. Cash sales were routinely skimmed to steal sales taxes and avoid paying income taxes. We did not want to support the government with our tax dollars. It did not deserve our hard-earned money. We didn’t like our customers any more than we liked the government. Customers were considered to be fools to be taken advantage of. 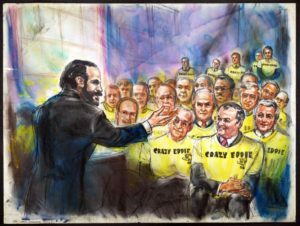 Eddie often told me, “People live on hope.” The Antar clan ruling Crazy Eddie and top management exploited the hopes and dreams of their victims in the pursuit of money and power. Eddie Antar skillfully developed a tightly-knit, loyal company culture to insure that our crimes went undetected and unreported. In the early years, a person was required to be a relative, a friend of the family, or a friend of a friend of the family, to work for the company. There were no so-called “employees.” Rather, we were “Crazy Eddie people,” and we called ourselves that. There were no “punch clocks” or employee review sessions. Everyone working at Crazy Eddie was considered part of the extended family. Crazy Eddie even developed its own internal language which was a combination of Arabic, pig Latin, and other retailing slang, handed down from the Antar family’s multigenerational merchant roots. Eddie Antar, the “retailing revolutionary,” was a ruthless competitor. Eddie Antar knew that the business could not survive in the long run if it constantly offered steep discounts to consumers without somehow earning enough revenue to pay the bills. Therefore, Eddie Antar resorted to a combination of income tax evasion, stealing sales taxes, and “bait and switch” practices to make Crazy Eddie profitable. Crazy Eddie used tax evasion to reduce its labor costs and make the company more competitive against other retailers. Some of the cash skimming was used to pay Crazy Eddie people “off the books” to avoid paying payroll taxes. In addition, employees paid off the books did not pay income taxes or social security taxes. So this was a clear win-win for the whole Crazy Eddie family. Back in 1970s, customers were much more likely to pay for electronic items with cash than they are now, and we took full advantage of that. 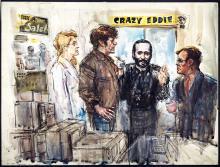 When a customer paid in cash, Crazy Eddie stole the sales taxes, making additional unreported gross profit of about 8%. This gave us a great competitive advantage against competitors who conducted their businesses legitimately. Crazy Eddie sales people used high pressure “bait and switch” sales tactics to “steer” customers towards higher profit-margin merchandise after baiting them into our stores with our highly popular and well-known “beat any price” policy. The first sales person’s main job was to “switch” the customer or “SW” the customer to higher margin products and services. For example, the sales person would recommend alternative, higher profit products of better value and quality, and high margin extended warranty plans, which were always a bad deal for the consumer. If the first sales person did not succeed in “switching the customer” to higher margin products and services, a second sales person was assigned to ease into the conversation to “take over” or “T.O.” the customer in an effort to make a bigger profit. If the second sales person was unsuccessful in swaying the customer to purchase higher margin products, a third sales person known as the “nail at door” person or “NAD” person made the final effort to convince the customer to purchase higher margin products and services. Only after three attempts to get the customer to purchase higher margin products did our sales people finally allow the customer to purchase the product that they originally intended to buy when they walked into the store.